Step 2: Cream butter and sugar. Beat in eggs, vanilla, and salt. Add flour slowly and beat until combined. Stir in toffee bits. Step 3: Spread batter into prepared pan. Bake 30-35 minutes. (Toothpick should come out clean when inserted in center of cake.) Let cool completely before lifting cake out of pan by grasping sides of aluminum foil. Step 4: Cut cake into squares or freeze for a later date. Serve warm or at room temperature. I’m not sure why, but I don’t tend to bake with toffee. My choice add-in is usually chocolate or some kind of fresh or dried fruit. Making me a little apprehensive of the toffee blondies recipe that was up next on my list to bake. There must be a reason I don’t use toffee: Did I have a bad cooking experience or eat a toffee desert that wasn’t delicious? I’m very good at forgetting the bad things that happen to me in life, maybe this was one of those cases…it was not! I had to force myself not to cut the hot toffee blondies immediately after taking them out of the oven. The smell was intoxicating. (Yankee Candle would most certainly benefit from a ‘toffee blondie’ scent, if they don’t already have one.) I didn’t think I would be able to wait until they were cool, and I was right. I had my first toffee blondie bite when they were warm. Great decision. They were delicious! My husband agrees. The toffee blondie recipe was fantastic. Easy to make and tasted great! Everyday Food said it perfectly when they suggested this baked-good for lunchboxes, bake sales, or to share at a friend’s house party. 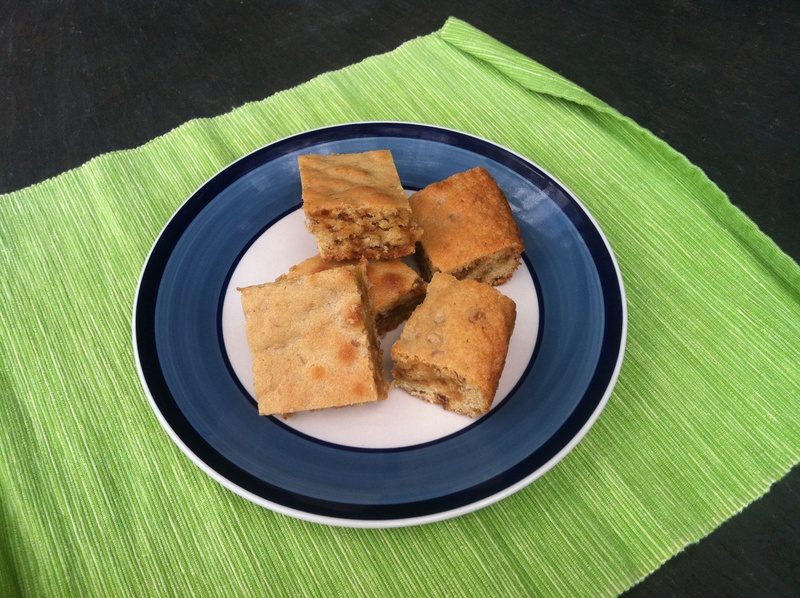 We chose to bring the toffee blondies to a friend’s house and they were a hit!